Stainless steel is an alloy, which is iron-based and contains various combinations of other elements to give it characteristics suitable for a wide range of applications. The element that makes stainless steel stainless is chromium. By definition, any steel, which contains a minimum of 11% chromium, is a stainless steel. The chromium content in the steel produces a rich, transparent oxide film, which coats the steel and protects it from corrosion and oxidation. For more information or to receive a prompt stainless steel price quote, please contact us at 800 398-4345 or submit the Request Information form on the right side of this page. 300's - Chromium-Nickel Stainless Steel this series is austenitic, non-heat treatable, and non-magnetic. 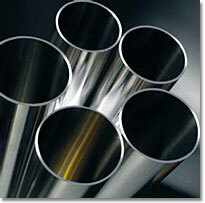 400's - Chromium Stainless Steel this series is martensitic, heat treatable and magnetic. It also includes types, which are ferrite, non-heat treatable, and magnetic. This class is so named for the man, Martens, who first examined metals microscopically. It is referred to as "martensitic" because of its acicular or needle-like microstructure in the hardened condition. Its chief alloying agent is chromium, found in amounts from 11.5 to 18.0%. It contains from 0.08 to 1.10% carbon. It is magnetic and responds excellently to heat treating, producing a hard and strong stainless steel. This class name is derived from the Latin word "ferrum" meaning iron. It is so named because its microstructure is very similar to that of low-carbon iron. It also utilizes chromium as its chief alloying agent, being found in amounts from 14.0 to 27.0%. It has a very low carbon content of .08 to .20%. Due to its high chromium and low carbon content, ferritic alloys do not generally harden in high temperatures. It is a magnetic alloy, and is soft and ductile. The austenitic class derives its name from Roberts-Austen who first observed its charac­teristic banded grain structure. Its chief alloys are: chromium, found in amounts from 16.0 to 26.0%; and a appreciable nickel content from 6.0 to 22.0%. This alloy cannot be heat treated, but responds excellently to cold working. It is generally non-magnetic. In the an­nealed condition, this alloy is tough, strong, and extremely ductile. Austenite itself is soft and tough and remains ductile even at extreme low temperatures. This is a relatively new class metallurgists have deemed necessary to group separately be­cause of its increasing popularity. These alloys have low hardening temperatures that produce precipitation hardening. This capability averts problems such as warping, cracking, and scaling. They can be hardened by simple heat treatments, require no stress-relief treat­ment and are available in all forms. These grades are easily fabricated, and are corrosion resistant without added treatment. They are also known for their high strength. An American Iron and Steel Institute (AISI) Type designation has not been issued these grades, as they are patented proprietary. These alloys contain only approximately .03% carbon, which is low enough to permit elimination of carbide precipitation during welding. These grades are not generally recommended for high-temperature utilization. Aluminum (Al) - acts as an active degasifier and deoxidizer. Controls inherent grain size. Bismuth (Si) - acts to improve machinability. Boron (B) - improves hardenability and increases depth of hardening. Usually found in amounts of .0005 to .003%. Carbon (C) - improves hardenability, and increases tensile strength and response to heat treatment when added in amounts of 0.8 to 0.9%. If amount is further increased, heat and cold workability would greatly decrease, and the alloy would begin to exhibit the character­istics of cast iron. Chromium (Cr) - gives stainless steel its stainless quality. Increases response to heat treatments and depth of hardness. In combination with nickel, greatly increases corrosion and oxidation resistance. Also increases toughness, tensile strength, and resistance to wear. Cobalt (Co) - increases strength and hardenability of alloy. Improves effectiveness of other elements. Columbium (Cb) - increases immunity to carbide precipitation and inter-granular corrosion. Copper (Cu) - increases corrosion resistance and improves tensile and yield strengths with­out loss of ductility. Iron (Fe) - this is the basic element of steel. Iron by itself lacks strength and does not respond to heat treatment; it is soft and ductile. Lead (Pb) - greatly improves machinability in quantities of .15 to .35%. Manganese (Mn) - normally present in all steel. Increases strength, hardness and response to heat treatment in amounts of .5 to 15%. It acts as a degasifier and deoxidizer, and increases the alloy's resistance to wear. In combination with sulfur, improves forgeability. Molybdenum (Me) - increases strength, hardness penetration, and machinability. Aids in resisting softening at high temperatures, and improves resistance to corrosion. Nickel (Ni) - in amounts of 1.0 to 35% improves the strength and impact resistance without loss of ductility. Increases resistance to corrosion, but decreases work hardening. Improves machinability and fabricability. Nitrogen (N) - can serve as a substitute for a portion of nickel in alloys. Improves machinability by producing a fine chip. Phosphorus (P) - increases yield strength, hardness and machinability and greatly improves resistance to corrosion. Ductility is decreased at low temperatures. Selenium (Se) - serves to improve machinability. Silicon (Si) - it is a common degasifier and deoxidizer. Increases tensile strength, hardenability and forgeability. At high temperatures, resists corrosion and scaling. Sulfur (S) - in amounts of .06 to .3%, increases machinability. It is not recommended for alloys used in hot forming. It decreases weldability and ductility. Tantalum (Ta) - used primarily as a stabilizer. It also prevents localized carbon depletion. Tellurium (Te) - when added to leaded steels, greatly improves machinability. Titanium (Ti) - serves to increase immunity to carbide precipitation and resistance to cor­rosion and oxidation. Tungsten (W) - produces a fine, dense grain. Increases hardness in high-speed steel at high temperatures. Vanadium (V) - increases shock resistance, strength, and hardness. Retards grain growth even after exposure to high temperatures. No. 1 Finish - this finish is mainly used for applications where appearance is secondary. It is hot rolled, annealed, and pickled. No. 2B Finish - used primarily for drawn or formed parts, this is a bright, cold rolled sheet finish. No. 2D Finish - this finish is similar in application to the 2B Finish, but is a dull, cold rolled sheet finish. No. 3 Polish - a 100 grit abrasive belt is used here to produce a ground surface. This polish is a standard mill finish. No. 4 Polish - a 150 grit abrasive belt is used here to produce a bright, highly polished surface. This process offers a finish that is not only beautiful, but is exceptionally corrosion resistant and easy to clean. No. 6 Polish - a Tampico brush is used here for a contrasting trim and softness of appearance. No. 7 Polish - this finish is the most highly reflective, having an extremely highly polished surface. This grade is an austenitic stainless steel manufactured by-the electric furnace process. Its chromium and nickel content are lower than most other grades, offering the advantage of a high work-hardening rate which combines cold-worked high strength with good ductility. Tensile strength and hardness increase rapidly when the metal is cold rolled, cold drawn, or worked at room temperature. The standards of the aircraft industry are met by requiring adequate discard to be extracted from each ingot. Its application is indicated where low cost is desired and high corrosion resistance is not a primary concern. Type 301 finds its primary usage in products necessitating great strength, but where working at elevated temperatures is not required. Used extensively in aircraft components, truck components and bodies, decorative applications, and etc. Does not possess as high a degree of corrosion resistance as Type 302, but does remain unaffected by most normal atmospheric conditions. Type 302 is the fundamental alloy of the austenitic class. It is commonly known as "18-8": 18% chromium; 8% nickel; and is the most commonly used of all the stainless grades, Type 302 is non-heat treatable, but cold-working considerably increases both its hardness and tensile strength. Type 302 in the cold state offers great versatility of workability because of its toughness and ductility and can be rigorously spun, rolled, drawn or machined. It offers outstanding weldability. It is extremely resistant to corrosion, and retains an untarnished silvery surface. It is also resistant to heat oxidation at temperatures up to 1500° F. It is non-magnetic in the annealed condition. The principal drawback of Type 302 is that of sensitization-under extreme conditions, carbide precipitation may occur. Type 304 alleviates this problem by decreasing the carbon content and thereby eliminating the possibility of intergranular corro­sion. This low carbon alloy is most often utilized for applications requiring welding. An Extra Low Carbon alloy, Type 304L is also available for especially severe welding applications. Type 304L has the capability to avert any detrimental precipitation in the extreme 800° F. to 1650° F. range. Both types are extremely popular in the food and dairy industries and for use in pharmaceutical equipment. It is exceedingly useful in applications where good mechanical properties and corrosion resistance are essential. It is highly desirable for products such as instrumentation where non-magnetism is fundamental. These grades are available in a wide range of forms and finishes. Types 302, 304 and 304L exhibit good corrosion resistant qualities, particularly those corro­sions caused by atmospheric conditions or chemicals. They lose some resistance at temper­atures of about 750° F. to 1500° F. due to carbide precipitation. Type 304L however, has excellent corrosion resistant capabilities within this temperature range because of its low carbon content. Maximum corrosion resistance in all these grades can be achieved by annealing. Types 303S and 303Se are both free-machining modifications of Type 302. Sulfur or a combination of selenium and phosphorus are added to this "18-8" chromium-nickel alloy to promote chip formation in machining rather than spindly spirals. Type 303 has uniform machinability and can be machined at speeds of SAE 3120, 3145, and 4615, adapting it very well for automatic screw machine applications. Manufactured by the electric-furnace process, this is a non-heat treatable alloy, the hardness and tensile strength of which may be increased greatly by cold working. It has good corrosion resistance, and is non- magnetic in the annealed state. It concurs with the stringent requirements of the aircraft industry. Type 303 is most commonly used in applications requiring extensive machining, and where corrosion resistance, non-magnetism, and a good surface finish is imperative. Common utilizations of this alloy include aircraft fittings, shafts, spindles, and automatic screw machine applications. Because of the additions of sulfur or selenium, the corrosion resistance of Type 303 is slightly lower than that of the other austenitic alloys. However, annealing increases its resistance to corrosion substantially. Type 310 is the grade of stainless steel containing the highest chromium-nickel content of all grades - 25% chromium, 20% nickel, It is chiefly known for its superior scaling and corrosion resistance and it excels all other grades in its high temperature physical properties. At extremely high temperatures, its creep strength and resistance to brittling far surpasses all other austenitic grades. In the annealed state it is non-magnetic. Type 310 is a non-heat treatable alloy pro­duced by the electric-furnace process, which concurs with the exacting standards of the aircraft industry. Type 310 finds primary utilization in applications requiring excellent heat and oxidation resistance and where superior strength is a must. Common applications are found in the aircraft industry for engine parts and parts requiring welding, oil refinery equipment, heat exchangers and furnace parts, etc. This grade possesses excellent corrosion resistance and withstands scaling at temperatures up to 2000° F. Its corrosion resistance reaches a maximum in the annealed condition. Type 316 is an electric furnace processed modification of Type 302: it contains 18% chromium; 8% nickel, and; 2-3% molybdenum. This addition of molybdenum increases both the corrosion resistance and the high temperature strength of this alloy. The most outstanding advantage of this addition is the increased corrosion resistance to reducing acids and pitting or pin hole corrosion. In general, Type 316 is known as the major all-around corrosion resistant austenitic stainless steel available. Under extremely elevated temperatures, Type 31 6 proves itself to possess remarkable creep and rupture strength, This non-heat treatable, non-magnetic alloy possesses excellent cold forming and drawing properties, making it suitable for a wide range of applications. Type 316L is an extra low carbon modification of Type 316 recommended for use during welding operations. The low carbon factor eliminates the possibility of harmful carbide precipitation in the 800° F. to 1500° F. range. Type 316 and Type 316L find their greatest use in the chemical, textile, paper, pharmaceutical, and photographic industries because of their excellent resistance to chemical corrosion. They also find use where the combination of corrosion resistance and extremely high strength at elevated temperatures is necessary. Type 316 is known to be more resistant to atmospheric and chemical corrosion than any other grade of the stainless steels. Maximum corrosion resistance may be obtained by fully anneal­ing this alloy. If the application calls for welding, Type 316L should be used as it is highly resistant to carbide precipitation and intergranular corrosion. Which usually occurs at high temperatures. Type 321 is an electric-furnace processed austenitic stainless steel. It is non-heat treatable and non-magnetic in the annealed condition. This alloy contains 18% chromium, 8% nickel and a substantial addition of titanium. The titanium forms insoluble and stable carbide, which ties up all the carbon in the alloy and therefore prevents it from precipitating as chromium carbides. This leaves the chromium in solution to resist corrosion to a very high degree. This is extremely beneficial in applications of temperatures ranging from 800° F, to 1600° F., as it eliminates the necessity for re-annealing after fabrication. Type 321 is used principally for applications involving welding or sustained elevated tem­perature operations where re-annealing is not practical, It is used extensively in the aircraft and missile industries for engine parts, heat exchangers, exhaust stacks, rocket engines, manifolds, and etc. This alloy is extremely resistant to intergranular corrosion and has very good corrosion resis­tance in weld areas. It has slightly less corrosion resistance to atmospheric conditions than Type 302 or Type 304 in the annealed condition. Type 347 is a non-heat treatable, austenitic, electric furnace processed grade of stainless steel very similar in composition to Type 321. The major difference between Type 321 and Type 347 is that rather than having an addition of titanium, Type 347 has columbium added to it. Tantalum occurs in nature in conjunction with columbium and therefore it may be said that both are additives to this alloy. Type 347 can withstand more severely elevated temperatures than Type 321, as the resulting columbium carbide is more stable and insoluble than the titanium carbide. The only drawback in the use of Type 347 as opposed to Type 321 is that it is not recommended for use in radioactive services as radioactive tantalum has a much longer half-life than columbium. It is non-magnetic in the annealed state. Type 347 is mainly used where corrosion resistance and sustained operations at temperatures between 800° F. and 1600° F. is of the utmost importance. It is also a superior grade for use on heavy welded objects, which cannot be re-annealed. It finds its principal applications in aircraft and missile engines, high temperature equipment in chemical industry, manifolds, furnace and blower parts, and etc. Resistance to intergranular corrosion and carbide precipitation is excellent with this grade. Its general atmospheric corrosion resistance is good, being similar to that of Type 302. Type 410 is a magnetic, martensitic, heat treatable alloy that is 12% straight chromium. It has excellent creep strength and corrosion resistance. Heat treatments may be applied to develop a very wide range of mechanical properties and hardness. It is popularly used for parts operating at temperatures up to 850° F.
Because of its high strength and versatility in heat treatment applicability, and because of its good mechanical and machining properties, Type 410 finds usage in a wide range of applica­tions. It is used for low-cost cutlery, food industry machine parts, pump shafts, valve parts, compressor shrouds, and abrasive applications. It is not generally recommended for high-stress usage above 1200° F.
Type 410 has excellent corrosion resistance to normal atmospheric conditions discoloration or a rusty film may occur under some conditions, but destructive scaling will not occur. It reaches its maximum corrosion resistance when hardened and polished. Type 416 is an electric furnace processed, magnetic, free-machining grade of the martensitic stainless steels. It is a modification of Type 410 with approximately .30% sulfur added for excellent machinability. Like Type 410, it has an exceptionally wide range of mechanical properties obtainable through heat treating, This grade of stainless steel has the highest machinability of all grades now developed, and can often be used in the "as machined" condition without heat treatment. Because of its excellent machinability, corrosion resistance, and high strength. Type 416 is normally used for applications requiring extensive or high speed machining such as: nuts and bolts; pump parts; screw machine parts; and etc. This grade has very good overall corrosion resistance to normal atmospheric conditions, mildly corrosive chemicals, and acidic or alkaline water. Hardening and polishing increases its corrosion to its maximal level. Resists scaling at temperatures up to approximately 1300° F.
15-5 PH is a chromium-nickel alloy containing a 5% copper additive, which permits it to be hardened by low temperature heat treatments. The high percentages of chromium and nickel give-15-5 PH excellent corrosion resistance, transverse toughness and forgeability. This alloy is produced by the vacuum arc re-melt method, which enhances ductility and toughness. 15-5 PH has excellent physical and mechanical properties and may be deep drawn, forged, welded and formed. 15-5 PH is very similar both in composition and application to 17-7 PH. Because of its high strength and excellent corrosion resistance, 15-5 PH finds extensive use in the aircraft and missile industries for parts ranging from instrumentation to landing gear components. 15-5 PH has excellent overall corrosion resistance, being comparable to that of Type 304 in most media. Heat-treating increases to the highest degree its resistance to stress-corrosion cracking. 17-4 PH is a chromium-nickel alloy that has a 4% copper additive, which enables it to be hardened by very low-temperature heat treatments known as precipitation hardening. The high percentages of chromium and nickel give this alloy excellent corrosion resistance, physical properties, and a high level of strength at temperatures up to 800° F. The major advantage of low temperature heat treatments is the elimination of distortion and scaling. 17-4 PH has excellent mechanical properties and may easily be welded, deep drawn, forged, and severely formed. This alloy is excellently suited for applications requiring high strength, good corrosion resist­ance and good resistance to seizing and galling. 17-4 PH finds extensive use in the aircraft and missile fields, for motor shafts, instrument parts, gears, and etc. The corrosion resistance of 17-4 PH is slightly less-than-the superior resistance of the chro­mium-nickel grades, but is somewhat higher than the straight chromium grades. It possesses very good corrosion resistance against all atmospheric conditions. Finish and heat treatment affect the level of corrosion resistance beneficially. 17-7 PH contains 17% chromium, 7% nickel and 1% aluminum. It is a precipitation hardening steel capable of reaching very high strength and hardness without any loss of corrosion resist­ance. Surface scaling and distortion in heat treatment is eliminated by its ability to be treated at very low temperatures. In the annealed condition, it has excellent ductility and machine­ability. It retains remarkable mechanical and physical properties at temperatures up to 800° F.
17-7 PH is used for applications necessitating high strength, good corrosion resistance and good mechanical properties at elevated temperatures. Characteristic applications include surgical instruments, springs, bearings, aircraft panels, and etc. The corrosion resistance of 17-7 PH is superior to the straight chromium grades. Surface finish and aged heat treatments tend to have a beneficial effect upon the corrosion resistance of 17-7 PH. Generally speaking, oxidation or corrosion resistance is proportional to the amount of chromium contained in the steel. In order for the chromium additive to accomplish this, oxygen must be present. Should any breaks in the chromium oxide coating occur, the chromium oxide, in the presence of oxygen, can regenerate itself and therefore sustain this protection. Should there be an absence of oxygen, or in some reducing conditions, this protective film may be destroyed, and consequently, the stainless steel is termed active. Most stainless or heat resisting steels are either melted by the electric furnace process or vacuum arc re-melted. Heat treatment for hardness and strength is recommended mainly for the straight chromium steels. Cold working is generally utilized for the chromium-nickel classes of steel and has the advantage of increasing strength while retaining good ductility. AISI Type 321 Stainless Steel, annealed and cold drawn bar, 25 mm diam. ASM Aerospace Specification Metals Inc.